It’s a New Year and time for a new you! Try these exciting new recipes that are full of flavor without the fat and your New Year’s resolutions can truly become a reality. The secret:French's® Mustard. America’s favorite mustard is 100% natural and has been for over 100 years. It also has zero calories and while it’s a popular condiment, home cooks are just now realizing that just a little mustard adds a lot of flavor to everyday recipes. These exciting new recipe sensations are so delicious you won’t feel you’re sacrificing anything, so you’ll have the resolve to continue your healthful objectives long into the New Year. 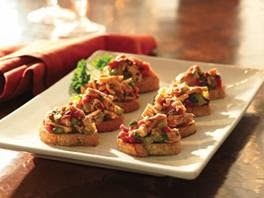 Serve the shrimp salad in martini glasses for an elegant presentation. Prep Time: 15 min. Cook Time: about 3 min. Chill Time: 30 min. 1. COOK shrimp in boiling water to cover about 3 min. until shrimp turn pink. Drain and cool. 2. MIX vinaigrette, mustard and yogurt in large bowl. 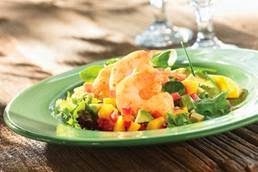 Add cooled shrimp, mango, bell pepper and avocado. Toss gently until coated. Chill. 3. SERVE on salad greens. If desired, garnish with fresh chopped cilantro or basil. Nutritional Analysis Per Serving: 264 Calories, 9 g Fat, 1 g Saturated Fat, 0 g Trans Fat, 222 mg Cholesterol, 26 g Protein, 19 g Carbohydrates, 5 g Dietary Fiber, 491 mg Sodium. Tips: Cooked and peeled shrimp may also be purchased from the seafood department. Papaya or peaches may be substituted for the mango. Prep Time: 15 min. Cook Time: 12 min. 1. MIX turkey, 4 Tbsp. mustard, 4 Tbsp. parsley, and 1 1/2 tsp. spicy seasoning in large bowl. Shape into 4 patties, 1/2-inch thick. 2. COMBINE sour cream, remaining 2 Tbsp. mustard and 2 Tbsp. parsley, relish, capers and remaining 1/4 tsp. spicy seasoning in small bowl. 3. GRILL burgers over medium-high heat for 12 min. or until no longer pink in center, turning once. Serve on rolls with spicy remoulade. Nutritional Analysis Per Serving: 374 Calories, 8 g Fat, 1 g Saturated Fat, 0 g Trans Fat, 61 mg Cholesterol, 43 g Protein, 37 g Carbohydrates, 6 g Dietary Fiber, 835 mg Sodium. Nutritional Analysis Per Serving (without roll): 200 Calories, 5 g Fat, 1 g Saturated Fat, 0 g Trans Fat, 61 mg Cholesterol, 37 g Protein, 4 g Carbohydrates, 1 g Dietary Fiber, 525 mg Sodium. Tip: If the spicy seasoning is not available, substitute 1/8 tsp. ground red pepper in the sauce. This light-style tuna salad makes a good first course served over toast rounds. 1. MIX juice and mustard in medium bowl. Add remaining ingredients and toss to coat well. Cover and chill. 2. SERVE tuna salad over lettuce, on whole wheat rolls or on toast rounds. Nutritional Analysis Per Serving: 136 Calories, 4 g Fat, 1 g Saturated Fat, 0 g Trans Fat, 30 mg Cholesterol, 18 g Protein, 5 g Carbohydrates, 1 g Dietary Fiber, 392 mg Sodium. FRENCH’S®Foods, a division of Reckitt Benckiser, Inc., the maker ofFRENCH’S® Mustards, is a leading manufacturer, marketer, and distributor of food and household products. Some other well known, trusted household names in the Reckitt Benckiser, Inc., family of food products includeFRANK’S® REDHOT® Cayenne Pepper Sauce, FRENCH’S®French Fried Onions and FRENCH’S® Worcestershire sauce.